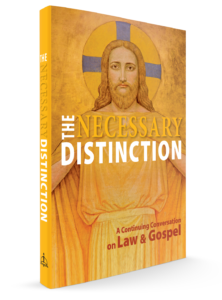 What happens when the distinction between the Law and Gospel in the Bible is blurred? Arrogant sinners gain a false sense of security toward God based on their own works and self-righteousness. Broken sinners see God's lofty standards and despair that they will ever be free of their guilt and sin. Congregations begin adopting the views of the culture around them. It may not seem like a big deal, but keeping these two main teachings of Scripture clear and distinct is essential to know where we stand with God.